If you are a home or business owner ins search of a Sandwich roof cleaning company you should be able to feel confident that you are getting the best service and results. 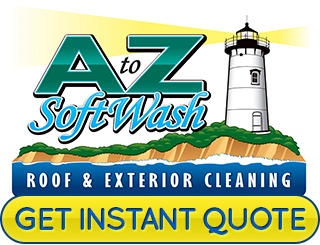 This is why so many locals call on A to Z Softwash to get the job done. 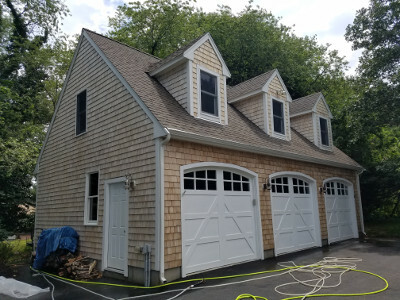 We take great pride in our ability to offer excellent service work that leads to superior results for pressure washing and roof cleaning in Sandwich, MA. The exterior of your home says a lot about you, whether you realize it or not. While it can be easy to become oblivious to the current condition of your exterior because you see it every day, you can be certain other people notice. What your roof and exterior look like right now either add to or detract from the curb appeal and property value. More than likely, when you pictured your dream home it did not come complete with a stained roof and dirty exterior. So why are you accepting living in that now? Let us help you get the look you should have for the outside of your home. It may come as a surprise but your homeowners insurance could get canceled if you have black algae streaks on your roof. This asphalt shingle eating organism is putting the integrity of your roof at risk so your insurance provider doesn't want to be held financially accountable for roof damage. For your own peace of mind, doesn't it make sense to want to know your roof is in good shape. Without addressing the need for cleaning, you could end up having to replace your rooftop long before it should be time. Worried about the threat of damage high pressure power washers present for the exterior of your home? Well, you are not alone even though many so-called pros still rely on this system for exterior cleaning services. This is why we utilize the softwashing technique. As the name would imply, this is a gentler approach that gets you superior clean without possibly damaging your wood surfaces, windows, shingles and more. 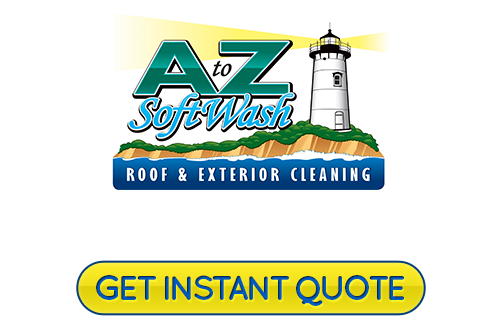 A to Z Softwash can also provide you with the best in house washing services as well. You will be amazed at the before and after of your home once we complete a full scale cleaning. Enhance the look, improve performance and maximize longevity with any of our exterior cleaning services. Get in touch with our Sandwich pressure washing experts right now to get started. If you are looking for a reliable Sandwich roof cleaning or pressure washing professional then please call 508-209-7795 or complete our online request form.